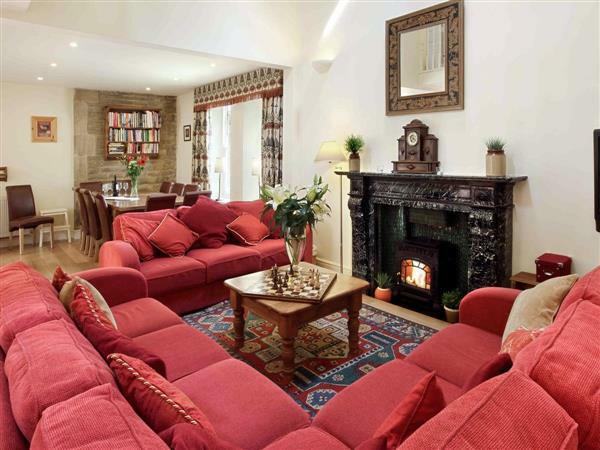 The Old Gallery at Westwood Lodge Cottages in Ilkley sleeps 10 people. Westwood Lodge Cottages are a selection of 8 properties which were built between 1875 and 1890, and are all Grade II listed historic buildings. The cottages are set on the very edge of the world famous Ilkley Moor, in the ancient West Riding of Yorkshire. You are literally on the moor as soon as you cross the cattle grid from the driveway. Whilst there is little traffic other than the odd passing sheep, pheasant or deer, you are only a 10-minute walk from the market town of Ilkley, where you will find a wide selection of shops, restaurants and bars, and not forgetting Betty’s tea rooms where afternoon tea is a must. Westwood Lodge Cottages (refs 30532 [Applebarn Cottage], 30533 [Coach House Cottage], 30534 [Orchard Cottage], 30535 [The Glenmoor], 30536 [The Moorview], 30537 [The Wells], 30538 [The Main House] and 30539) make an ideal base for sight-seeing and walking direct from the door. Famous nearby destinations include Bolton Abbey, Skipton, Harewood House, Brontë Country and the heart of the Yorkshire Dales National Park are all within half an hour’s drive. Alternatively the historic city of York is readily accessible. For the added comfort, dressing gowns will be provided in The Wells (30537), The Moorview (30536), and The Glenmoor (30535). Westwood Lodge Cottages have shared use of the leisure facilities including gym, sauna and hot tub with changing rooms. There is also a communal garden with animal corner where there are pigs, hens and rabbits. Shops, pubs and restaurants 1/2 mile. Ground floor: Living/dining room/kitchen. 2 bedrooms: 1 double (5ft), 1 single. Bathroom with shower over bath and toilet. First floor: 3 bedrooms: 1 double, 2 twin, one (zip and link, can be 6ft double) with additional single and en-suite shower room with toilet. Gas central heating included. Two digital TVs. CD. Washer/dryer. Freezer. Small enclosed garden and furniture. Parking (2 cars). Wheelchair access. All properties: Electricity, bed linen and towels included. Cot. High chair. DVD. iPod dock. Electric cooker. Microwave. Dishwasher. Telephone included. Wi-Fi. Shared grounds with animal corner. Cycle store. Shared leisure facilities with gym, sauna, hot tub and changing rooms. Welcome pack. No smoking. Holidays at The Old Gallery at Westwood Lodge Cottages run from Friday to Friday. For a better idea of where Westwood Lodge Cottages - The Old Gallery is, you can see Westwood Lodge Cottages - The Old Gallery on the map below. You can find more large holiday cottages (that's cottages which sleep 8 or more people) in West Yorkshire. If you want to see more large cottages, have a look at large cottages in West Yorkshire. Westwood Lodge Cottages - The Old Gallery is in West Yorkshire; should you be on the lookout for a special offer, you can find all the special offers in West Yorkshire. It's always worth checking to see what is on offer at the moment. Do you want to holiday near Westwood Lodge Cottages - The Old Gallery (30539), you can see other cottages within 25 miles of Westwood Lodge Cottages - The Old Gallery; have a look to find your perfect holiday location.